Inspired by Prince William's marriage to Kate Middleton, this E-Book Anthology offers Three Short Stories, Centering around real historical royal weddings of the past, by three New York Times Bestselling Authors. Stephanie Laurens’ THE WEDDING PLANNER: Lady Margaret is proud to plan the ton’s most important nuptials—including that of a prince. But it’s Lady Margaret who falls in love…with dashing Gaston Devilliers! 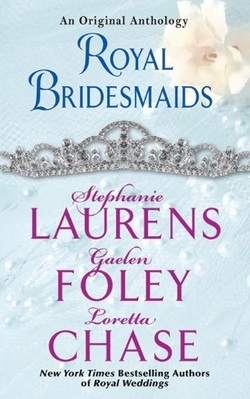 Gaelen Foley’s EVER AFTER: How scandalous! Eleanor Montford, the Countess of Archer, is in love with her own husband. And as Princess Charlotte of England weds Prince Leopold of Saxe-Coburg, Elle’s secret is about to come out. Loretta Chase’s THE JILTING OF LORD ROTHWICK: On the eve of Queen Victoria’s wedding to Prince Albert, the Marquess of Rothwick learns his fiancée, Barbara Findley, has broken their engagement! So he desperately rides out of London to seek her out… and to win her back. Thanks to Pippa Middleton, we are more fascinated than ever by bridesmaids…especially the ones in Royal Weddings. Now, in this original anthology, three New York Times bestselling authors tell us what it really takes to get the bride to the royal altar. They need to do more than "Smile, Wave and Look Delighted!" 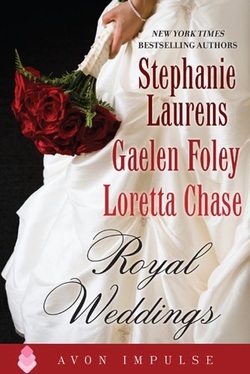 Stephanie Laurens: RETURN ENGAGEMENT: Lady Nell Daughtry has her hands full getting her sister safely married to the Prince of Lautenberg. And things aren't made easier when she discovers she's paired with Robert Knightley…her would-be husband who walked away. Gaelen Foley: THE IMPOSTER BRIDE: To secure peace for her country, Lady Minerva must ensure its princess is wed to handsome Prince Tor of Rydalburg. But when the bride bolts, Minerva decides on a daring deception and bridesmaid becomes - bride! Loretta Chase: LORD LOVEDON'S DUEL: Chloe Sharp will to anything to show the world her sister's marriage to a prince is a success. So when she hears the handsome Earl of Lovedon insinuating it was a match made in money, she challenges him to a duel - only to learn that what's really at stake isn't honor, but her own heart. This story will probably appeal most to readers who've enjoyed my Ascension Trilogy. It's been a long time since I got to write about fictional European kingdoms, and I had forgotten how much fun it is! In this story, I crystallized various cultures of northern Europe into Rydalburg, and southern ones into Saardova. The fierce Rydalburg warrior folk of the mountains are a blend of Vikings, Russians, Austrians, and Germans, while the sultry Saardovans were inspired by the Italian, Spanish, and Moorish cultures, with a little of the South of France thrown in for good measure. What fun! I hope you enjoy it. I think you'll find it intriguing - and romantic! - to see what happens when "north" and "south" meet, their biases about each other clash, and long-nursed mistrust must be overcome. At core, this is a heart-of-the-genre style romance about two very different people from different backgrounds discovering mutual understanding, trust - and true love.